Located deep in the desert, in Sophanem, Pyramid Plunder is a game devised with a thief in mind, and there are two ways you can play it: Either to gain as much thieving experience as you can in the shortest amount of time, or try to find as many trinkets as you can and sell these to Simon Templeton. Jagex states this is a dangerous Activity and it is true you can die while playing it, causing you to lose all but 3 items you carry, were you to use Protect Item prayer (level 25 needed) this would of course be 4 items. At the same time it is a fun thing to do with the bonus of enormous amounts of thieving experience. Starting the game for the first time, the fastest way to get to the Pyramid is using Ali Morrisane's Magic Carpets. Fly to Pollnivneach from Shantay Pass, switch to the southern hub, and buy a ticket to Sophanem. 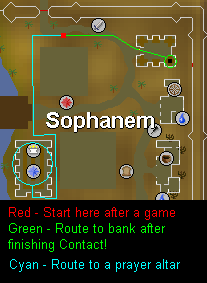 The second possible route is after a Camulet teleport and then running/walking from the start point of Enakhra's Lament to Sophanem. The last one requires you to have your house located in Pollnivneach, teleport to your house and take a carpet ride to Sophanem. Should you have played this game before, and have been rewarded with the Pharaoh's Sceptre, then you can teleport directly to the pyramid. But this will be explained later on. Depending first and foremost on your Defence level, armour is suggested for those with a low level. Higher leveled players are safe using only a legends cape or higher, Boots of Lightness and food. Both food and anti-poison can be brought noted to be un-noted later on in Pollnivneach, be sure to bring enough money. For all levels it is advised to take Anti-poison Potion. There is a possibility you will be attacked by fairly high leveled monsters when opening the Sarcophagus and/or Grand Gold Chest. A decent Defence is needed against them. Should you have made the mistake of opening the Grand Gold Chest before the Sarcophagus you will need to kill the Scarabs before you can open it. Any weapon will do, take the one you are most comfortable with. Boots of Lightness will reduce your weight and preserve your running energy. Rings are optional and the best advice would be to take a Ring of Life to prevent you from dying inside the pyramid. Lower leveled, in this case also, assumes lower thieving levels, hence the Snake Charm and Lock-pick in the suggested inventory. The food is self-explanatory: It is there to keep you alive, Snake Charm will help you to thieve the urns safely. The Lock-pick is there to make the transition to the next room a bit easier. After you have reached level 65 thieving you can leave the Lock-pick in your bank (or drop it), as the experience gain warrants opening the doors without one. 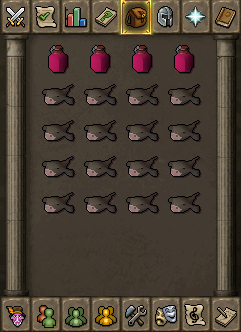 You will need to experiment how many Anti-poison potions you will need per inventory food. Higher leveled players can do without the armour if their Defence level is 70 or above. This will further reduce your weight and prolong your running ability. The only difference in your inventory are the 'helpful items', your thieving level should warrant leaving them at home: They take up valuable space and without them you will be about as fast as with them. The experience-gain is far higher without. Warning: Traveling in the Desert can be hazardous to your health. When trekking through it and not using the carpets, adjust your equipment and inventory to allow for this: Waterskins and Desert clothing are a must. This game can be a fun experience and even a reasonable source of income. The object of the game is to thieve your way through as many rooms, urns, chests and sarcophagi as possible. And you have only five minutes to complete it! To start the game you will need to find the Mummy guarding the Pyramid. There are a possible four doors where he can hide behind. You will use your thieving skills to enter, but it is possible the Mummy will stun you and you will loose 30 hp in the process. 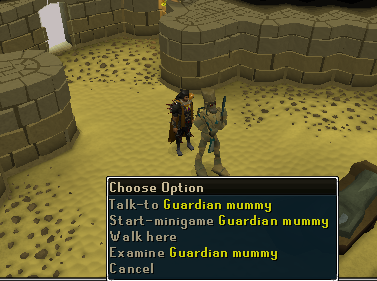 Tip: If you have a Pharaoh's Sceptre, you can use it to teleport directly to the Mummy and save some time. Enter any of the doors and should he not be in there, go outside again (you will exit and always end up at the northern door) and try the other doors until you find him. The first time you play this game you will need to go through the whole conversation with him. If you have played it before you can right-click him and choose the second option to start the game. Starting in Room 1 and ending in Room 8 each room requires a ten level higher thieving level than the room before: Room 1 needs level 21, room 2 needs level 31 all the way up to room 8 for which level 91 thieving is required. When starting the game you will always start in room 1 and you will have to make your way through the following rooms to get to the highest one available to you. The first thing you will see is a Spear trap. You will need to "temporarily deactivate" this by clicking on it. Note that this trap is two squares in length and should you click on the square farthest from you, you will get hit by the first one. Once safely past this trap your journey begins: If you have a thieving level below 31 this will be the only room available to you. You now can start thieving the urns in the room and they will yield trinkets. Every room contains 13 urns in total, each with a snake in it. A failed attempt and the snake inside will bite you, depending on the room you are in you will loose 10 Life Points in room 1, 20 Life Points in room 2-4, 30 Life Points in room 4-7 and finally 40 Life Points in room 8. This biting will also poison you, the poison starts hitting you for 20 Life Points and is the same in all the rooms. 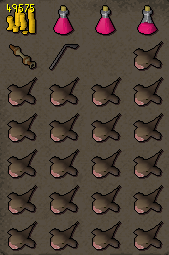 The lowest possible loot is an Ivory Comb, the highest one available is a Golden Statuette. In the rooms you will also find one Sarcophagus and one Grand Gold Chest. Both of these can hold the highest reward: the Pharaoh's Sceptre. Just make sure you thieve these last: They can hold a nasty surprise. From the Sarcophagus a level 84 Mummy can spring and start attacking you. The Grand Gold Chest can hold an even nastier surprise: Level 98 Scarabs that will attack and poison you immediately (poison starts at 30 Life Points and will hit often). Though it is possible to hide from the Mummy and Scarabs it is no use: You want to get to the next room. 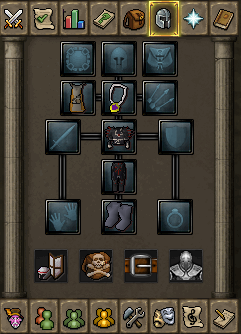 Best solution is to turn on Protect from Melee prayer to stay safe. The lay-out of each room is different even though the content is always the same. There are four possible doors to the next room, one door to leave the game, 13 urns, the sarcophagus and the chest. With every next room the chance of obtaining those golden trinkets becomes higher. And they bring the most money when sold. When playing this game you will get rewarded in two ways: With the trinkets you gather and the thieving experience gained. 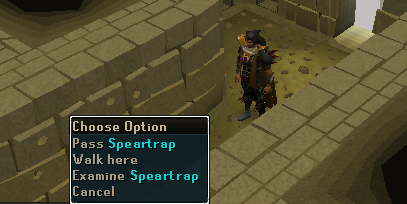 The thieving experience is self explanatory, the trinkets bring money and can be used to charge the Sceptre should you have it. 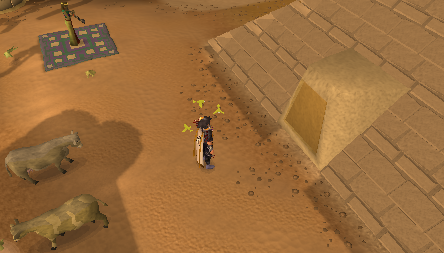 When selling your items to Simon Templeton at the Agility Pyramid you can sell all trinkets except the Pharaoh's Sceptre, and a good thing that is too, as it allows you to teleport to three pyramids in the Kharidian Desert. First of all the Pyramid of Jaleustrophos or commonly know as the Agility Pyramid, secondly the Pyramid of Jaldroacht, or the pyramid of Desert Treasure and finally the Pyramid of Jalsavrah, the northern pyramid in Sophanem where you play this game. You will be teleported directly in front of the Mummy which will make banking and returning very easy. The Sceptre has minor combat bonuses. 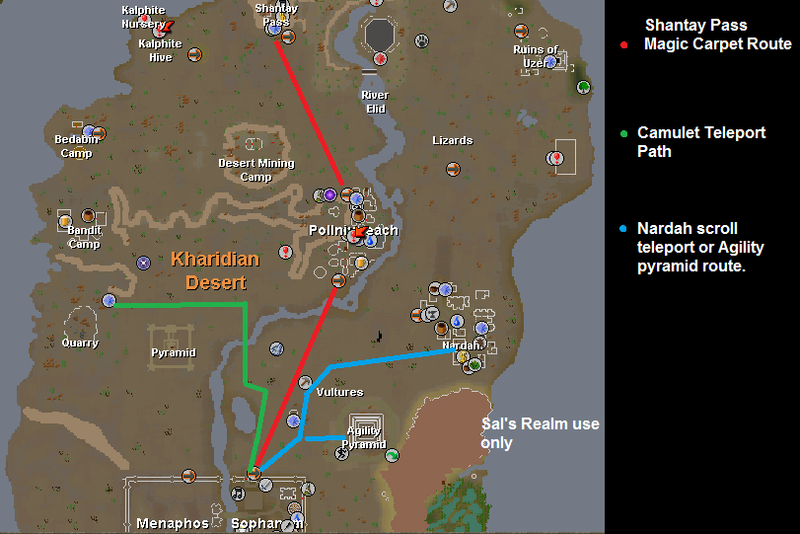 The Pharoh's Sceptre also allows teleportation to three pyramids in the Kharidian Desert. The locations are as follows. The Pyramid of Jalsavrah, the northern pyramid in Sophanem where you play this game. You will be teleported directly in front of the Mummy which will make banking and returning very easy. It is recommended that after using two charges, to teleport to the mummy to recharge again. This is more efficient than waiting until you've used all three charges. As you can see from the table the highest amount of experience points are gained when NOT using 'helpful' items like lock-pick and flute. At lower thieving levels, above 21 up to 65, it is advised to bring a lock pick to get past the doors to the next room as fast as possible. The trick in gaining as much experience as possible is to reach the highest room available to you, with just enough time left to finish looting all the urns in the room, including the Grand Gold Chest. This means you need to do some research yourself: Find out how much time you need in the last room and then plan your trip. Leave the Grand Gold Chest and the Sarcophagus until the last moment, then first the Sarcophagus (no experience for that one) then the Grand Gold Chest. Once you have a Pharaoh's Sceptre skip the Sarcophagus altogether. Both of these can spring a monster on you: A level 84 Mummy from the Sarcophagus and level 98 Scarabs from the Grand Gold Chest. If you do not have a teleport out of there, either by Amulet of Glory or Ring of Duelling, bring a water skin: Dying of thirst is not a pretty sight. For thieving levels 41 the experience gain is around 30-40k per hour played. At very high thieving levels the experience gain can be up to 200k per hour played. 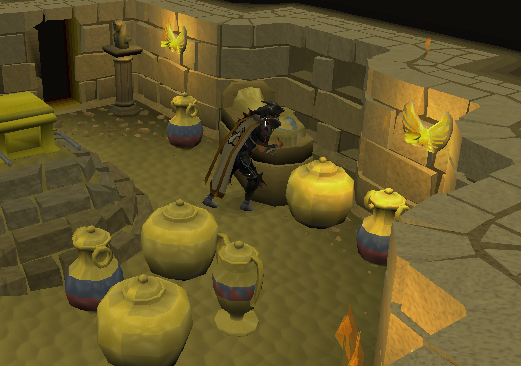 After finishing the Spirits of Elid quest you will have access to a statue where you can replenish your prayer. What is more, praying there will also give you a +7 hp bonus. 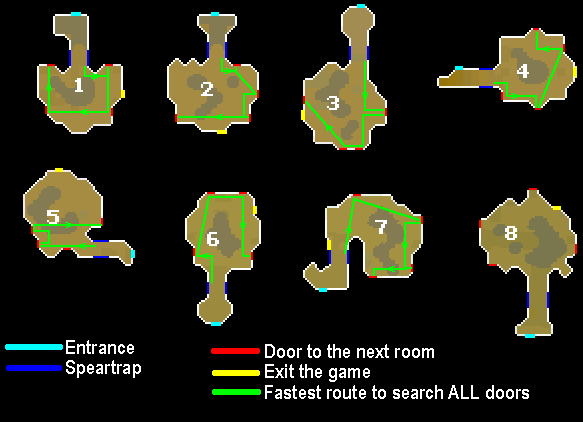 Part of the strategy used in the maximum experience strategy needs to be used: You want to get to the highest possible rooms as quickly as you can. The better rewards are handed out there. Yet, in all this requires a different approach: You want to thieve as many items possible, with the highest possible value. This requires you to take least amount of food possible. For this you need one item in particular: A Flute. It can be obtained from the Snake Charmer in Pollnivneach, south of the bar. With this flute in your inventory you can thieve the urns in a way that will rarely cause you to fail: Right-click the urn and choose the option: 'Check for snakes'. The lid will pop-up and a snake appears, now right-click again and choose the option 'charm snake'. This will make it possible to thieve the urn with a higher percentage of success, but it is slower. Depending on the number of rooms you can access, thieve only the Sarcophagus and Grand Gold Chest on your way to the highest possible room: They bring the best rewards. Make sure you have enough time left to thieve all urns in your highest possible room and in the last minute tackle the last Sarcophagus and Grand Gold Chest. This is the lay-out of the various rooms you can enter. Though the doors in room 8 are colored differently they all have the same function: To exit the game. The door to the next room is random each time you enter, though there is one trick to help you: Should a fellow player have entered the room just before you his door to the next room will be yours too. Take a close look at what door he takes and it will save you some time to get there yourself.